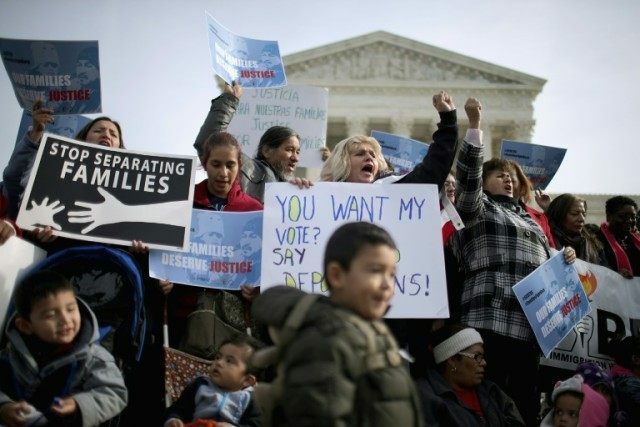 Washington (AFP) – The US Supreme Court weighs a major immigration case Monday that could impact the fate of millions of people facing possible deportation and further raise the stakes in the 2016 White House race. But the Supreme Court hearing also puts the spotlight on Obama’s efforts to circumvent a hostile Congress, with his detractors accusing him of unfair, even illegal, overreach. “This lawsuit to stop President Obama’s illegal immigration policy is about a concept as old as the nation’s founding — the separation of powers,” Texas Attorney General Ken Paxton said in a statement. “The Court’s decision in June could redefine the balance of power between Congress and the president,” he said. Mirroring Obama’s gridlock with Congress is that of a Supreme Court evenly split between liberals and conservatives while Senate Republicans refuse to hold hearings, let alone a vote, on replacing the ninth seat left vacant in February by the death of justice Antonin Scalia. For now, the Obama immigration policy is on hold under lower courts’ orders, so even a Supreme Court ruling — expected by late June — in the administration’s favor would only leave about seven months to implement the program before the president leaves office in January. “That doesn’t mean they would take it away from the people who have received it,” tempered Stephen Legomsky, who served as chief counsel at US Citizenship and Immigration Services under Obama. The justices are examining several narrow questions on the immigration case, such as whether immigration initiatives impact state governments enough to give them the legal “standing” to sue the federal government. That question is key to Texas, which claimed it would cost the state millions of dollars in public funds to provide driver’s licenses to the huge group of immigrants who would be allowed to stay in the United States. The Supreme Court is also being asked to determine whether Obama’s 2014 actions were “arbitrary and capricious” under federal law and whether they should have followed a lengthy public review process. In addition, the justices are weighing whether Obama fulfilled his constitutional duty to “faithfully execute” existing federal immigration laws passed by Congress in trying to make changes through executive action. If the justices can’t agree, lower court rulings — which largely sided with the states against the Obama administration — stand.